EDITOR’S NOTE: Updated in March 2019 to reflect that the night light stopped working properly and had to be discarded. Aldi sometimes sells the most random and fascinatingly curious things. Like color-changing shower heads. Or pumpkin salsa. Or the Easy Home Motion-Activated LED Toilet Bowl Night Light. At only $6.99, it was too interesting to resist. It comes with a manual that offers setup and cleaning instructions. There is no warranty. The night light also requires three AAA batteries, which are not included. To start, give your toilet a thorough cleaning. (Trust me.) 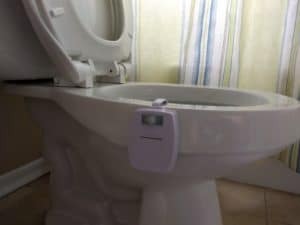 Then, load the batteries in the night light, and lift the toilet cover and seat. 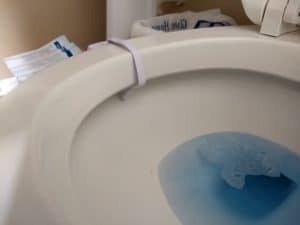 Bend the flexible arm mount into a “U” shape and hook it over the side of the toilet bowl. 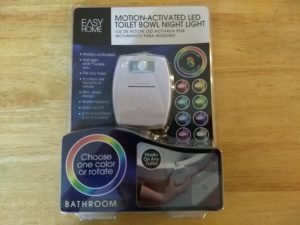 Place it so the motion sensor, which is just above the Easy Home logo, faces the bathroom door so the light will turn on when a person walks into the room. The manual also recommends tucking the tip of the light, which contains the tiny LED bulb, under the inside ledge of the toilet bowl. The light bulb is on the tip of the skinny part of the night light. The light should fit snugly on the toilet bowl and should be flat on the toilet rim and not positioned at an angle. When the toilet lid is closed, it should not come into contact with the front of the night light. The manual states the light turns on when anyone walks into the room and the room is dark, although we found that the night light came on when it was light in the bathroom as well. You can set the night light so that it changes colors or so that it stays a single, solid color. The default setting appears to be the color-cycling mode, which rotates through eight different colors, but you can set it to stay one color by pressing the Color button once on the upper left corner while the light is the color you want. To return to color-cycling mode, press the Color button one more time. The night light is water resistant, but the manual states it is not waterproof and it should not be submerged in water or washed under the faucet. 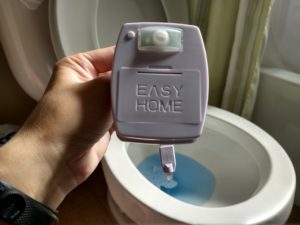 To clean the night light, the manual says to remove the batteries and wash the surface with a non-abrasive sponge or towel and a mild detergent. Allow it to air dry, and then replace the batteries and re-attach the light to the toilet. While this night light looks really cool, I wonder how sanitary it is. There is real potential for it to get … dripped on. Especially if this light is positioned on a toilet that boys use. Also, the light probably should be removed temporarily from the toilet if a stomach bug runs through your house so you avoid any unwanted splatters. I’ll probably use Aldi’s disinfectant wipes to clean this light when I clean the rest of the bathroom, and that should do the trick, but it still is a bit gross to think about handling the light to clean it. UPDATE (March 2019): After about five months of use, this night light stopped working correctly. I had to change the batteries around the four-month mark, and the night light was never the same after that; it only lit up blue and green, with no other colors. Around the five-month mark, in late February or early March 2019, the light became weak, and sometimes it did not turn on at all unless I pressed the button on the front of the light, and even after pressing it, the light would often fade or turn off. This was a cool product that served as an interesting conversation piece when guests used our bathroom, but unfortunately it did not last. 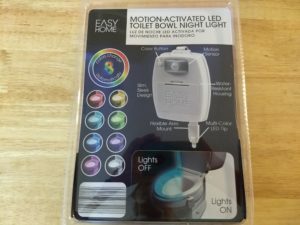 Aldi’s Special Buy (ALDI Find) Easy Home Motion-Activated LED Toilet Bowl Night Light is a novel addition to any bathroom. You can set it to stay one color or to cycle through eight different colors, which is more fun. 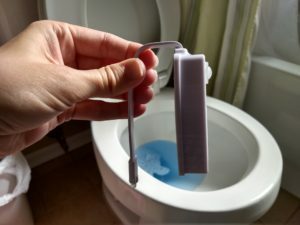 There is an ick factor because the light hooks into the toilet bowl, which means there is a good chance that it will get peed on, especially if boys use the toilet. The light and its battery compartment can be cleaned with a sponge or towel and mild detergent or disinfectant wipes. Sadly, this night light only served us for about five months before the light stopped showing all colors, weakened, and then stopped working. Because there is no warranty, my light ended up in the trash. Loved it but it only lasted about a month and it quit working. Lately, with any cheap digital type of product, I have noticed that the brand of battery matters. Specifically, Duracell batteries do not fit right in some devices. The little chrome bits on the end are not right for the cheap Chinese chrome stuff on the inside of the device. One company specifically said to me, do not use Duracell on their products. Since, I had a lifetime supply of AA Duracell from Costco, I returned that product. 1) have a battery tester (I’d say get one at Radio Shack that does all battery types but, I guess Amazon maybe now?) and test even new batteries before using them. 2) if a device is kaput, try two brands of batteries before *recycling* the device (at Best Buy or if your local waste company takes electronics). Also, before you give up and recycle, take a pencil eraser and clean the contacts on the inside of the device and try batteries all over again. An “ink” eraser eraser is even better. Blow out the leftovers. Ours went out with the trash (which was picked up this morning) so it’s gone permanently, but I can tell you that we did use Duracell batteries in it. I’d be curious if using a different brand would have made a difference.